It is a bit cryptic, so I leave you to ponder for a little while. 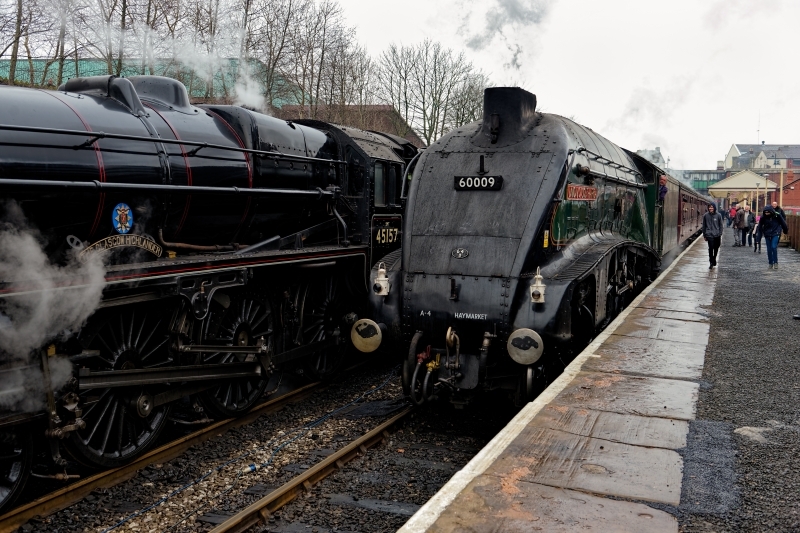 Here we have two guests at the Spring Steam gala Event at East Lancashire Railway, March 2018. The guests had been gathering all week for this special weekend. I think though, that the organisers must of been thinking would they arrive on time? The weather in the U.K. had been atrocious all week with heavy snow and Winter Storms, all tied in with very sub zero temperatures. Leander literally made it with hours to spare. i was there on the final day, Sunday. With the temperature up to a balmy +2 degrees. Thursday saw it at -6 degrees. Now I know there are a lot of colder countries, but you have to understand, we never see temperatures as low as we had seen this week. As one fellow photographer remarked when I suggested it was a bit warmer today. He disagreed and said, no, it's just less cold! So we have Union of South Africa arriving on platform along side The Glasgow Highlander, both with Scottish connections. Union spending a lot of her working life between Aberdeen and Edinburgh. While The Glasgow Highlander operated between Carlisle and Glasgow. Which brings a clue to the title of this photograph 46 miles? It's the distance between Glasgow and Edinburgh. Well done if you guessed it..